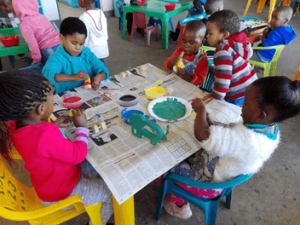 Teacher Nomonde attended the ESF (Educators without borders) Conference in Stellenbosch earlier this month, which was a great time of learning and sharing. The teachers from ILM are mentoring the new wave of teachers in training from the local area- what a perfect cycle! 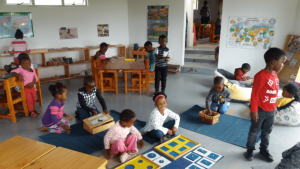 ILM have also had two qualified European Montessori teachers spend time with them, observing and seeing how they can assist the school going forward. In May, Sustainable Coffee Bay (ILM’s parent organisation), won 4th place at the Inspiration Awards- what an incredible achievement! Dawn also attended the ESF conference and they also won a prize at the Inspiration Awards- excellent work guys! Ncinci Ones is becoming more and more the ‘little home’ that Dawn envisaged. They have a soft reading area, bright sunny working areas, a veggie patch and even a cat. This safe, welcoming environment is ideal for young minds to learn. 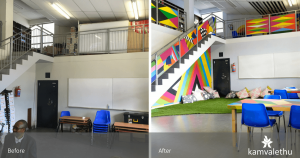 Last month we shared that the library is finally a reality at the school! I am happy to report that it is in full use and part of the school day. It is also open for afternoon programs and Grade 7’s are assisting as library monitors. Zimkitha, the awesome librarian is receiving support and mentorship to make every effort to see this library succeed. Thank you to everyone who has been a part (no matter how small- it all helps!) of this journey. The Maths Buddy programme has continued its roll out into further grades and another local school. Further to this expansion, the iiTablet Tshomiz programme has added a Languages component. 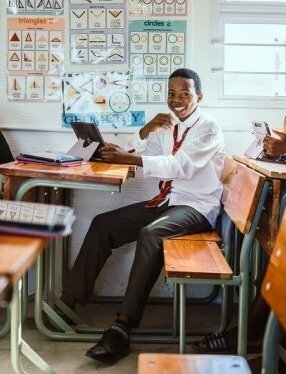 It was found that learners often struggle with Mathematics, not necessarily because of the mathematical concepts but because they don’t understand the English and their ability to learn English is affected by gaps in learning isiXhosa! A new teacher, Zonke Silwanyana, has joined Bulungula from UCT and she has been an amazing asset in figuring out how to approach these complexities. A significant amount of work has been done at the Bulungula College which now has all the infrastructure and furnishings it needs to officially open in 2019!